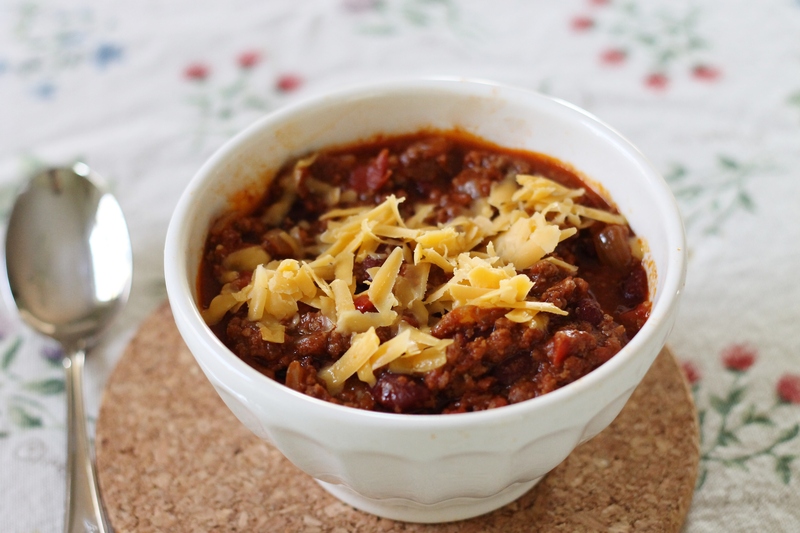 Everyone needs a good, basic chili recipe before winter starts. While this chili does have to simmer for several hours, it’s still pretty easy because there is not too much hands-on time. Generally, we’re not huge fans of chili with kidney beans, but this chili has plenty of thick sauce and meat to even out the beans. Now, is this chili the best in the entire world? Probably not, but it is hearty and delicious and perfect for a winter day (especially served with some cornbread on the side!). Ideally, make this chili the day before you plan to eat it, because the flavors really improve after a day in the fridge. Enjoy! Heat oil in large heavy-bottomed nonreactive Dutch oven over medium heat until shimmering but not smoking, 3 to 4 minutes. Add onions, bell pepper, garlic, and spices; cook, stirring occasionally, until vegetables are softened and beginning to brown, about 10 minutes. Increase heat to medium-high and add half the beef; cook, breaking up pieces with wooden spoon, until no longer pink and just beginning to brown, 3 to 4 minutes. Add remaining beef and cook, breaking up pieces with wooden spoon, until no longer pink, 3 to 4 minutes. Add beans, tomatoes, tomato puree, and 1/2 teaspoon salt; bring to boil, then reduce heat to low and simmer, covered, stirring occasionally, for 1 hour. Remove cover and continue to simmer 1 hour longer, stirring occasionally (if chili begins to stick to bottom of pot, stir in 1/2 cup water and continue to simmer), until beef is tender and chili is dark, rich, and slightly thickened. Adjust seasoning with additional salt. Serve with sour cream and cheese if desired. Enjoy!